A colourful display of dancers and entertainers paraded through Grafton’s tree-lined streets for the 76th annual Jacaranda Festival where 58 Riviera enthusiasts enjoyed the festivities. 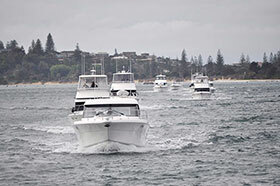 A fleet of 15 Rivieras ranging in size from 33 feet to 56 feet made the 130 nautical mile journey from the Gold Coast south to Grafton on November 4, for R Marine Queensland’s annual five-day Jacaranda Experience. 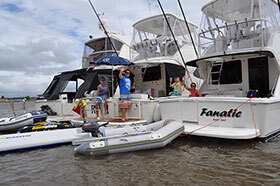 R Marine Queensland event organiser Melinda Jones said ‘with a decent swell, ocean wind and overcast sky looming around the Gold Coast Seaway walls it was onward bound for day one’s destination Yamba’. “The view of the coastline was a pleasant surprise taking in such sites as the distinctive Surfers Paradise skyline and the Byron Bay Lighthouse. The next morning, the fleet wound their way up the Clarence River, passing under the landmark Harwood Bridge and heading for their final anchorage, Grafton, which is about 42 nautical miles up the Clarence River. “The mighty Clarence has a history of its own with small townships such as the Scottish settlement of MacLean and the remains of the Old Butter Factory,” Melinda said. “The spectacular site of 15 Rivieras bow to stern snaking up the river created a real spectacle and excitement for the locals who gave us a friendly wave as we passed by. “After a night onboard it was time to step ashore to explore the town of Grafton and the events of The Jacaranda Festival. “Apart from local markets and displays, the highlight of the day was the colourful floats and sounds of the Jacaranda Street Parade. The following morning it was time to up anchor and leave Grafton. The fleet returned back down the river to Yamba where they berthed for the night and visited the well known Pacific Hotel for dinner. “The spectacular views from the Pacific Hotel was a fine finish to our trip,” Melinda said. 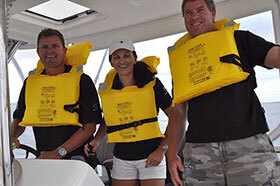 Riviera CEO John Anderson said Riviera dealers around the world organised these experiences to encourage Riviera owners to explore new waterways, meet new friends and gain confidence in their boats. In 2011 our R Marine dealers in Australia and New Zealand have a full and fun packed calendar of events planned for Riviera owners.